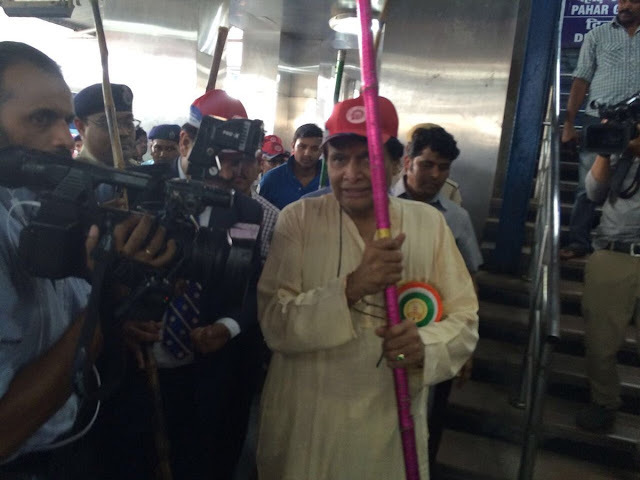 eading the campaign from the front, Railway Minister Suresh Prabhu on Saturday launched the 'Swachhta Saptah' as part of the Swachh Rail Swachh Bharat Mission from New Delhi Railway Station. In order to create massive awareness on sanitation and cleanliness in railway premises and make hygiene a habit amongst the travelling public, the Railways is organizing a special nine-day long public outreach programme from today, Prabhu said after launching the cleanliness drive. Stating that this day coincidentally marked the birthday of Prime Minister Narendra Modi, Prabhu said that it is befitting that the Swacchta Saptaah should commemorate his lofty vision and goals. Learlier in the day, Prabhu announced to join hands with Sulabh International to clean some important railway stations across the country. As a pilot project, Sulabh has started cleaning and maintenance of five important railway stations from today. These railway stations are Gorakhpur, Old Delhi, Jaipur, Ahmedabad and Gwalior. Lauding the effort of Sulabh International, Prabhu said steps will be worked out to seek assistance of Sulabh movement founder Bindeshwar Pathak for cleaning and maintenance of big stations. Prabhu unveiled a 500-kg laddoo to mark Modi’s birthday at a separate function. He also felicitated railway employees Jagdeep Hooda, Coach of Indian Boxing Team and Lalit Mathur, athlete of the Indian Relay Team at Rio Olympics 2016 on the occasion. In keeping with the programme, Indian Railways undertook intensive cleanliness drives on all stations. All stations wore the ceremonial look with posters and banners spelling the message loud and clear to the travelling public that the Railway is their travelling home. Railway officer and staff donned the ceremonial caps interacting with the travelling public and conducting inspections at station premises. Anti-littering slogans were posted at various locations. Dustbins for garbage were provided and awareness programmes were undertaken. Earmarking each day with specific focus area for spruce-up, the cleanliness programme has certain defined thrusts like Swachh Stations (Clean Stations), Swachh Rail Gaadi(Clean Train), Swachh Neer(Clean Water), Swachh Parisar(Clean Complex), Swachh Sahyog(Cleanliness Participation), Swachh Samvad (Cleanliness Dialogue), Swachh Samarpan (Dedication for ensuring Cleanliness), Swachh Aahar (Clean Food) upto 25th September 2016.